It’s not just the size of the hook you need to consider when fishing for big carp, you’ll also need to consider what pattern or shape of hook would be best for every fishing situation you may encounter. Have you ever wandered why there are so many different hook patterns available in the tackle shops? Here we discuss the basic patterns of carp hooks, as well as the potential each offers for hooking those big carp. 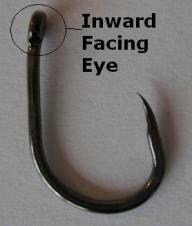 Many of the carp hooks available in the tackle shops have an inward facing eye. Most common hooks are based on this style because they can be used in many different fishing situations as well as with various types of rigs. When tied properly this pattern of carp hook turns much easier when in the carp’s mouth to help the point catch quicker. This hook pattern seems to be most effective when tied to braid using a knotless knot. Inward eye hooks with a straight point seem to be one of the best for quick hook holds, even more so when using the long-shank versions. The combination of a quick turn and greater area to help it find a grip means this in one of the best hook patterns for fishing in most situations from bottom bait, balanced bait and snowman presentations. 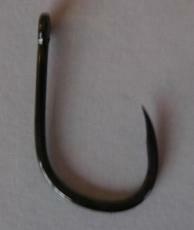 I use this type of hook for 80 percent of my carp fishing. Upturned carp hooks are those where the eye points away from the hook point. These are generally used for stiff rig bait presentations because the hook will remain straight when tied to stiff or rigid mono lines. This means the rig will sit in a correct angle for proper presentation and hooking potential. All hook used for carp fishing should always be very sharp and reliable! 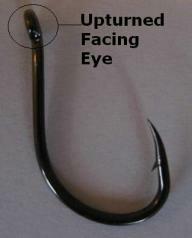 Straight eyed hooks are not used in many fishing situations. I think the best way to use these carp hooks is when fishing for carp on the top. If you superglue the shank of these hooks to floating baits and have the point directed away from the bait then the line will come straight off the eye and away from the surface. A good tip is to put a small shot into the bottom of the bait on the other side of the hook point. This will cause the bait to bob on the surface with the hook out of the water and out of the carp’s sight. The hooking ability of the straight eye can be improved dramatically by creating a line-aligner using shrink tubing, however, this takes a lot of time and effort plus, they only end up the same potential as downward eyed hooks. For this reason I hardly use them at all. These are carp hooks with a bent shank and an inward facing eye. They are very effective for hooking fish as they turn so easily without having to use a line-aligner. For this reason they may be best used when fishing for big, wary carp. Some carp anglers won’t use them as they believe they can cause damage to the fish’s mouths. I like to use them for very short rigs with supple materials and when the rig is laid on top of a heavy baited area. With heavy baited areas carp will often move slowly across the area whilst sucking and blowing bait into the mouths. The nailer’s ability to turn so quickly helps grip the inside of the mouth before they have chance to blow bait back out. As with all my rigs I tend to generally use a straight point carp hook. I feel these offer greater potential for gripping the flesh over the beak-pointed carp hooks. The beaked hooks may give a stronger hook hold but I feel they are less effective for actually hooking the fish in the first place. I usually play all my fish gently and rarely try to bully them to the bank. If I happen to be fishing near snags then I often use nailer carp hooks. Did this article reveal what different Carp Hook Patterns are used for?